Return To Easels Galore Home Page List of Business and Government Customers - You could be interested in just how many organizations own my easels. Andy Wakeley's Blog where he describes his new easel, a Fully Folding Horizontal to Vertical, made from Spotted Gum. Scroll down the page as you will see a lot of photos. The book stand turned is now assembled and in place. Looks like it will do the job nicely, although the dog isn't quite convinced and she seems to be ignoring it. I've attached aphoto as requested. I don't have a website, but you are welcome to use the photos but without any attribution. Jon - This is a freestanding book stand in Jarrah. We received your assembled easel the other day, and must say that we were very happy with the quality and finish of the final product. Its amazing how light and easy it is to move around the house. It truly is a fine piece of work. I've attached a photo for use on your website. The easel will occupy a prominent position in our lounge room, after other furniture is rearranged. Rest assured that we will recommend you and your business website to all who inquire. We currently have our exhibition on and the seminar is taking place tonight. Please find attached a panoramic image of the room set up with 50 easels – they look great! ADVANCEMENT MANAGER - University College University of Melbourne. The easels came today and I loved be them! They are so easy to adjust and they fit my large canvas. Will definitely be getting a few more in the future.Best wishes,Iris - Iris did place a second order. Donut wall on ABML2100 easel by Luxe Creations creators of truly amazing candy buffets. Thanks again for the easel. It looks and works really well. Pics attached in case you want some for your website. Helping Hand Group use my EBAL easels around Australia for their events. At Helping Hand Group, our team has raised and donated over $100 million for leading charities, community groups, schools, and sporting clubs since 1997. We help fundraising events with a long list of auction items and full event assistance with our electronic silent auction system, Ballot Bidding® programme, and expert fundraising event staff to help you raise more money for your special cause. Best of all, our services come at no cost to our clients! We provide auction items on a consignment-type basis and that means no cost to your event budget. Our friendly event staff will set up item displays at your event, manage the auctions, and take care of payments, removal, and shipping. That’s how we lend a helping hand. Some of the HCH2000 easels owned by Paul B in Sydney. Paul owns six model HCH2000's and two other high specification easels. Hi Jeff, Just confirming the easel arrived with us this week. We have now set it up with the picture which works well, as you will see in the attached photo. We received our easel this morning and absolutely love it. The craftsmanship is superb and we're thoroughly impressed with the custom modification for our larger canvas. Looking forward to putting the easel to good use at our next event. Thanks for the wonderful easels and such a quick turnaround. Here are the images I have received of our display at Government House for you to use on your website if you would like.The event was an acknowledgement of a very successful 20 years since the Phillip Island Nature Parks organization was formed. The easels worked a treat. The easel is a ABH1800 with a fixed rear leg. Hi Jeff, Many thanks for the easel, it should be very good for its purpose. Attached is a photo. I thought to send work in progress so it looks more real rather than a completed painting .Thanks for the great easel. My third so very happy with them! I have received the easel and finally got the chance to assemble it over the weekend. It is absolutely fantastic...best easel I have ever come across. I am an art teacher and I have seen and built many easels, yours is by far the best built! Thank you for the speedy delivery of my easel! It was so easy to set up, with the help of your instructions. Very pleased with the end result! I have now mounted my picture onto the aluminum easel. Noosa Springs, QLD - The Two EBAL easels are holding an estimated 20kg between them. I am forming a non-for- profit art group and require 12 easels to be delivered to the one address in Cammeray, Sydney. Could you please give me a quote for the same one that I bought before - that is - as below : ABHL1800S (Student model) Sanded Victorian Ash without top mount but assembled. Loretta - Loretta's art group has received their easels. Semi Folding Aluminum display easels used by TDA Interiors. Hi Jeff, Thanks so much for your help with the rushed easel order. Here is a picture of one in use! taken by Damian Parer famous war photographer .Thanks for the quick response and delivery. Two ABHL1800 easels of many owned by Inside the Brick to display various lego items. amazing and we are very happy with them. Two SSD2600 white display easels custom sized. This easel is designed to sit against a wall behind furniture without marking the wall. side which would then somehow get all over me. Your tray is perfect! I show off your easel to all and sundry. Mounting paintings ( I rotate the paintings) on the easel gives me much pleasure and certainly is a talking point for any visitors to my home. Kind regards, Robert - Easel is a ABKL1800 display easel. showed off my purchase to other class members. Many, many thanks for selling such a great product. appreciated. I hope you like the pics, it looks really good here on the floorboards. A recent business presentation of the easels we bought in use. Mate I am very happy. I would recommend you to anyone who wants an easel. You run a really good business. The easel is a 1.3 metre tall Jarrah Display A Frame special. This is a ABH1800 with top mount, Photo from Brian Harcourt. I am thoroughly impressed by the quality and design of my brand new, hand-crafted, easel. It is wonderfully flexible and strong, allowing upright positioning for painting, horizontal for illustration work and an infinite range of adjustments in between to suit even the most restless of artists! I am also using the ingenious addition of the tilt tray as a drawing surface, reserving the formal easel area to view my reference drawings with an easy, upward glance. The signature, cube-shaped knobs allow for effortless adjustment and are one of my favourite features giving the easel appealing character. The quality of the wood, finish and unique design are so easy on the eye that I am happy to have it on permanent display in my living room which currently doubles as my art studio as I am short on space! I couldn't be couldn't be more satisfied with my purchase and have a funny feeling that I may be ordering an additional desk top version in the not too distant future. Love your work. My name is Yolanda and I teach art in my home studio in Rouse Hill NSW. I found out a long time ago that a good easel can make a significant difference to one's painting experience.Some twelve years ago, I bought a floor easel from Easels Galore and because I have been so happy with it I recommended that one of my students (Joyce) buy her table easel from you. Joyce (seventy years young), has had a stroke and brain surgery, so her motor skills have been badly compromised. She has an excellent sense of colour and composition, but her technique relies on "dabbing" at the canvas with her brush, often causing smaller table easels to move away. There is wheelchair access to my studio, but we had initial problems finding an easel that was stable, didn't slide away and stopped the canvas from bouncing. The table easel (model DTWCH) her husband bought for her from Easels Galore is great. With the design and weight of the easel, it doesn't slide away and supports the canvas so it doesn't bounce. Joyce has a lot more control over her painting now and therefore enjoys it more. And we get to enjoy more of her wicked sense of humour. At the end of class the easel folds up easily, holding the canvas in place for carrying home.As a teacher, I highly recommend this easel to anyone who appreciates a good quality table easel, that stays put. PS: Joyce has given her permission to use the attached image of her on our websites.Tony, her husband, told me you offered to put my contact details linked to your website. I appreciate the offer. Looks Really Great, thank you so much, Carol. Hello, Jeff .... from Pennsylvania. A much enjoyed and appreciated easel. On a visit to Australia, I sent this HBH2000 with HD castors and tray to their hotel and they took it back to the USA as luggage. The easel is a ABHL1800 but the shelf is 120mm front to back to hold the deep frame. Hi Jeff – I’m pleased (but not at all surprised, given the great design and robust construction) to report that my easel is going strong after several years and proving simply wonderful in use. It’s not exactly light (mine is the mountain ash semi folding single post), but is compact when folded and easy to carry to workshops - and sets up quickly and easily once you know its secrets! Best of all it is oh so sturdy, even in workshops. Other easels collapse, slide down, break, require constant fiddling etc, but mine stays solid as a rock. Classmates watch in a befuzzled manner as I unfold it and set it up, but are soon asking questions about its clever design and compact footprint. I’ve finally got a reasonably decent pic of me using it so I thought I’d send it for your collection (I know you asked, but don’t think I’ve ever sent one to you). Robyn - Robyn has a FFH500 and I love getting emails like this from customers, years after they have purchased! Not a great photo, but it was the best of a bad bunch. I could take a few photos at my art group if you want some variety. 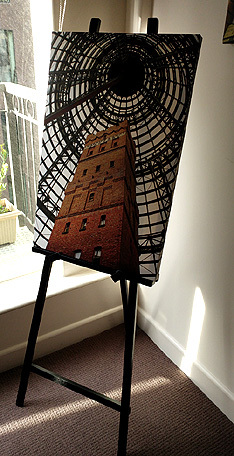 Please find attached a couple of images of the easel I purchased for my mum just before xmas. She was thrilled - it was exactly what she was looking for to display the print I originally bought for her on holidays in Bhutan. A definite win! Amanda. - Easel is 320 mm tall in Jarrah. In love with our new Easel!! Thank you!! I have a few upcoming events booked in with the Easel with chalkboard signage etc. Ill send you more pics as they come in. It's great, and it's going to be fabulous especially for my larger canvases. Hi Jeff, Here are a couple of snaps from the easels and how we are using at our events. Thanks! To confirm the first of the easels we ordered has come through and I’ve attached a couple of photos of the easel set up in the AGL Sydney office reception. Everyone seems very happy with the display too.This link http://www.agl.com.au/about-agl/how-we-source-energy/renewable-energy/nyngan-solar-plant takes you to the project for which the easels are being used for.The second easel is for the same project, but it will be set up in the Bogan Shire Council offices in Nygnan, NSW.Thanks again for your quick turn around with the easels. Great service! Regards Helena - AGL - they ordered two Heavy duty ABM1800 easels in Merbau to hold heavy sheets of glass. The shelf was modified to hold the glass. Easel arrived today - measures perfectly and looks great! I received the easels yesterday. They are absolutely beautiful, classy and stable and I'm very happy with them. Thank you for your craftsmanship. Hiro ordered 2 off 320mm easels in Jarrah. Easel is EBAL Aluminium Easel. City Light Church is a brand new church in Balmain, all about seeing people in the Inner West of Sydney come into a real relationship with Jesus. We meet every Sunday morning at 11AM at 482 Darling St Balmain, NSW. Please see the photo attached - hope it suits what you have in mind for you website. Ruby Ruby ordered a special ATM2100 easel for her Television. It has extended front legs and wider top and bottom mount. If she turns the tray upside down it increases surface area for a PVR etc. ABHL1800 easel at The Great Debate. Set designed by bluebottle: Bluebottle is a Melbourne based design company with expertise in combining light and form in inventive ways. The bluebottle team is accomplished in managing all aspects of a project to achieve an excellent outcome. Company members work across various art forms as creative consultants, designers, project managers and lecturers. As promised some pic’s of the easels which are now finally put together. They look great as you can see compared to the old ones. 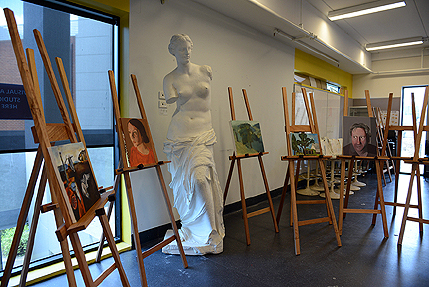 The Ku-ring gai Art Centre has purchased a number of HBH1800 easels over the years. As you can see with the older ones, they are well used. Modified ABML1800 Easel in Merbau with special mounts. What Hidden are rear supports for the photos. Owned by Burwood Council in Sydney. I'm Tony Kalemba and I have been painting for just over 2 years now. The Easel I purchased for easealsgalore.com.au has made my artistic journey much easier. As promised here is a photo of our use of your easel. It has not been used for its total height as yet. 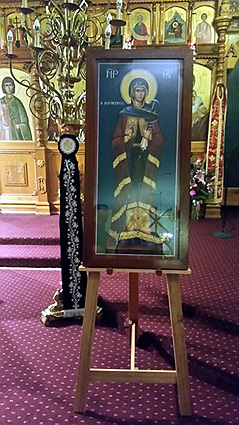 This has been used in our Chapel and remains there while we celebrate the life of a founding religious. Again, many thanks for assisting me in my hour of need! Kind regards, - Dearna - Dearna Brinnand - Stuartholme School Qld. H Frame Easels model HBH1800 with slim line 42inch televisions at a trade stand. A few years I've ordered (then with another company) a larger easel from you and used it at an expo tradestand. I'm not sure, if I ever sent you a photo. Regards, Vici. - Vici Just ordered a small easel off me. 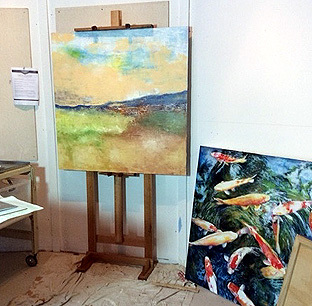 The easel in the photograph is a White ABHL1600 display easel. to display room information and directional signage for events. the easel is absolutely perfect, I no longer have to worry about hooks in the wall and as you can see its virtually invisible. Thanks for the great work and extremely prompt delivery. Easel is a Single sided wall display easel SSD2600 in white. Thanks for the fantastic service!! DSD1800 Black display easels holding community art at Erina Fair Shopping Centre. If you have any queries feel free to let me know. Attached is a pic of the easel with our honours board – looks fantastic!! Management are very happy! We are very pleased with the easels. portrayed in art and advertising. I have attached some images but they do have glare from the lights. The appearance has met and we think exceeded our expectations. We have probably spent more time looking at the easel than watching TV! Which is probably the right balance. Some of my work colleagues were quite intrigued by the idea and liked what they saw from the crummy pictures on my phone. We'll be in touch as soon as we have better pictures for you to use. David and Karen - David and Karen ordered a H frame TV easel, it is a special H frame. I will be making a dedicated web page as soon as I have the time. Grant's easel is holding up a 35 Kilogram Cambodian stone frieze. 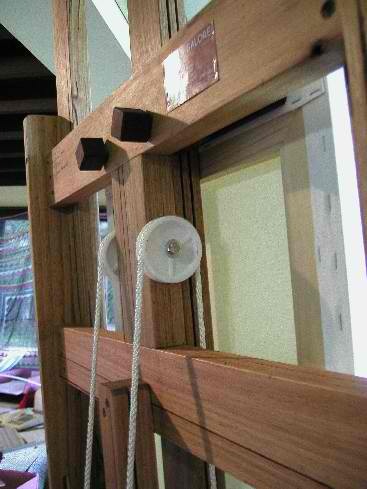 The easel is specially strengthened for the weight. I'm so happy with the easel that I can't even describe it. This is a such good quality that some top brands can't even be compared with it. I tell people about you and the quality easels you produce. I wish you all the best in the future. Looking forward to cooperate with you again. Alenka has a HCH2000 with tray and two palette holders. The Palette holders are folded in the photo. Thank you, as you can see I have received my easel, its wonderful . Please find attached the photo of the easel that I used at an event to display my sign board. The easel was pretty easy to use and very portable. Gavin - Easel is a ABH1800. thank you for the beautiful easel and the extra effort of sanding the easel for me. I have oiled it many times, to the point where it currently will not take anymore oil. Jeff, I am really happy with the easel. It is a classy piece of craftsmanship, so much so, that I thought it deserved a more durable reminder of its creator than the current business card which you staple to the back of your easels. I hope you don't mind but, I reproduced the Easels Galore business card design, re-sketched your easel photo and asked an engraving company (Talbot Walsh Engraving) to engrave the design on 5 brass rectangular plates. I have kept one of the brass plates myself and have sent the remaining 4 to you as a thank you for the extra effort of sanding the easel. This is the first time that i have arranged to reproduced a design in brass so, I hope you like them. None of this is of any cost to you but the brass plates are yours to keep if you wish to use them. I hope you like them. Once again, thanks for the wonderful work on the easel. I sent Rob a HCH1800. He had ordered an unfinished one, but I sanded it , ready to oil and he did not discover this until he opened the parcels. I will keep one of the plates (above) and fix the other 3 to HCH1800 easels. Thank you Rob, I got a lot of pleasure out of your wonderful gesture. Here is a photo of my beautiful easel in operation. I'm really loving it. Thanks again - it's such a joy to paint with. Megan - Megan purchased a HCH1600 with tray and twin palette holders, which are folded under the tray. When the easels arrived, they were professionally packaged in bubble wrap To avoid any damage. When opening we found your after care instructions and Of course the easels.My wife and I are very happy with the end product, not only that the finish and Quality is of high standard, but we were very surprised of the strength and construction of your easels. The choice of wood, was a perfect choice as it complimented the rest of our furniture. With the circular painting, this was painted by a friend of ours and was presented To us as a Christmas gift, it resembles my family at the beach fishing. This now proudly Sits on our buffet.With the book, the school my children go to, all of the mothers played there part and Selected their favorite recipes and make a book named after the school. This book Now proudly sits on the kitchen bench. We have look in the past at off the shelf easels and in no way do they come close To yours in quality and pricing. I have absolutely no hesitation in recommending your work to others. The easel arrived yesterday and it is beautiful. I really love it. Thank you so much. The easel arrived and I must say it was really well packaged, and beautiful quality, Thank you. I purchased the easel to have some of my work displayed in a local Bed & Breakfast. I’ve attached an image, though the easel is not in good sight and the lighting is pretty poor. The b&b is was built in the early 1930’s I believe, as a lodge for an inland golf course in Beverley, regional WA. Hi Jeff, Ii looks great - thank you! Claire Bucklow -The Rocks Williamstown. A luxurious new function space overlooking the stunning Port Phillip Bay. Unparalleled views and modern, elegant style combine to create a truly unique setting for your wedding, corporate function or private event. with our easels for training. I hope this a good indication for you! Natalie. - M.A.C. Cosmetics Have a good look at their web site for the worlds best Cosmetics and some pretty good photography too. on this piece this week and she is almost complete. Thanks again for such a beautiful easel. Hi Jeff, easels arrived safe and sound - exactly what I was looking for ... thanks for your prompt service on those. Just a follow up on my recent purchase of easel from you. We finally managed to get it together and it is now being well used. I have attached a photo as requested – though the painting shown is still a work in progress. This is a Counterweighted H frame I made in the prior to 2004. Owned by Anneke Newman. when Anneke ordered a second easel I asked for a photo of her old one, here it is but have a look at her web site, fabulous portraits of dogs. The Fingerprint Tree™ is an artistic and creative way to capture a significant day in someone’s life, whether it be a wedding, a first birthday, a christening, an anniversary, or a milestone birthday. The leaves of the tree are made up of all the family and friends that were there on the day. You simply write your name somewhere on the tree, then place your fingerprint over the top. www.michaelseebeck.com --- have a look at the Fabulous photos on this site. 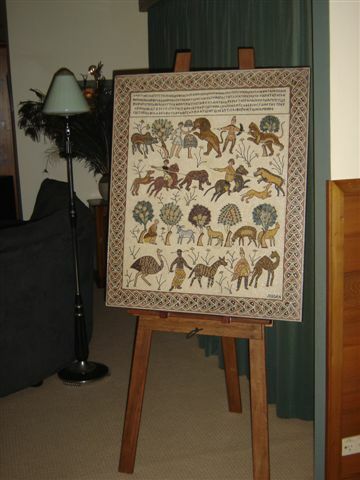 Attached is a photo of the framed silk rug on your beautiful easel. Thanks so much for such a beautiful job! Thank you so much for pulling out all the stops to ensure we had our easels at such short notice. As you can see from the photos' attached they look fantastic. perfect for what I needed it for. It's on my desk at work holding my letter press calendar. It looks great. Sandra purchased a DL sized small easel. Thanks for this Jeff. All good. Have been taking the easel to my art tuition. So light and easy to assemble. In the future will take it plein air,Painting....Outside Painting. Thanks again. Will put a recommendation on my blog. As promised, please see photo of set up Easel. As you can see I am using it to display a piece of artwork we have purchased. I haven't actually been painting for many years. My hope is that the easel and the space I made for it will encourage me to get back to it. Check out Leo's web site He specializes in artisan letter press printing of Wedding Stationary and other unique printing. Leo purchased a Special unfinished Merbau A frame and he finished it. took me no time at all to set up the easel. It is a beautiful , very well made and super sturdy easel . I am very happy with this easel and would be happy to recommend your easels to anybody. Here I attached a picture of my easel in use. The easel arrived just before Christmas - many thanks. The mosaic is titled Tree of Life; my partner Sharon Pech created it. My new easel arrived yesterday. It is a beauty. HUGE to be able to carry big canvases and it operates by counterweights, so to raise it or lower it - you just undo two knobs & raise and lower the bar with the touch of a finger. So easy for little girls like me. So if you want to raise it or lower it - you just loosen those two out side knobs (where you see three) at the front & raise or lower it.The big block at the back gives it the weight - there are two more blocks you can add to give it more weight for a heavier canvas.This guy does beautiful work. Takes pride & joy in it & is a perfectionist. Also a real darling to deal with - very helpful & is also an artist so he knows what is needed .I love the little knobs - no more wing nuts.!! - hoorah. This is a HCH2000 since 2002 I have made some changes since, but essentially the design is the same - Jeff. We received our easel yesterday and have set it up in the foyer section of the administration office (see attached pics).Thanks for such excellent and fast service. We are a medium size Government Public School in Sydney's northern suburbs and have chosen to showcase our student's fabulous artwork created at the NSW Department of Education and Communities on"Operation Art" program on the easel we purchased from you. We're very happy and think it looks great! Limed 430mm small easel owned by Chris Regan. A previous owner framed the Miro print in an ostentatiously substantial way; we don't mind the effect but the result weights 8.5kg. The easel is the perfect solution. It easily takes the weight and is quite stable. ABML1800 - Merbau display easels 1.8 metres tall at the Royal Australian Navy Fleet Air Arm Museum at Nowra in NSW. This display is Located in a restored lighthouse and the Merbau easels are a good fit in the decor. 10 easels are in the display. Paul Haggith purchased a HCH2000 Check out his web site for some wonderful art. The easel has arrived in good condition. Thanks very much for your prompt service! 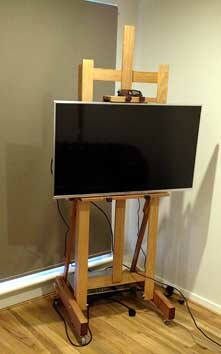 As promised please now find attached some images of the easel's with the TV's attached. I have attached higher resolution photos, incase you do want to use them for your website. Feel free to check it out our website we design and produce custom built displays (We designed and built this entire Samsung display you can see in the background of the photo's within three weeks :) ). Thanks again for your help – as you can see, they look great! Easels are HBH1800, you can order special mounts to hold televisions horizontally, or vertically. looking for. It arrived with no problems, and I assembled the easel straight away.We have it placed at the entry way to our house with our beautiful Peter Lik photography book on it. We bought a magnificent Peter Lik photography book which has hundreds of his photos in it. I can't remember if I told you that I assembled the easel. I took your advice and had no problems. Here is a picture of it in use. I'm working in a messy garage until I get the house organized. I'm finding the counter-weight a joy. I have back problems and I can move the canvas or me as required and find I'm less tired after a session in the "studio". Thank you so much for the wonderful easel. It arrived exactly when you said it would and I have been enjoying working on it for a few weeks now. It is beautifully designed, has great versatility and it is marvelously stable. My art practice is quite diverse. I like sometimes to work vertically and at others to work flat so the easel is perfect since it converts so easily. This is truly a tremendous asset to my art practice. Annael (Anelia Pavlova) - Easel looks like a H frame made form Oregon, design has since changed. I expect this easel is at least 7 to 8 years old at time of receiving photo. www.ragamuffinpetphotography.com.au You should check out Caitlins site, some of the best pet photographs I have ever seen! As you can see, the easel looks perfect with our art. Our new home is uniquely configured with one art deco wall, another wall with a high window, a third "wall" which is glass doors and then no fourth wall as the lounge room opens into the dining. There was no place to hang our painting. Finding your website was fate! The promptness with which you addressed my questions and provided me with the information I needed to make my decision was very fast. I appreciated your communication on where I was in the "queue" and in your process of building our easel. It's hard to believe that you were able to craft exactly what we needed and have it to us in less than a week. The instructions for assembly were very clear and the easel is so well made - I thank you for both. I wish you all the best. Could you please send me 2 more of the easels. We are so impressed with the compact easel we have decided to get one for each of our trainers. Rather than putting a big wooden easel in the 4wd and tying it down (unpractical ) we can slot this compact little easel into one of the draws in the 4wd. Sorry it has taken me so long to send photos. I have some others but I am yet to exhibit the works so I don't really want to put them out there! But here's one straight after construction and one inside my studio .Thanks, the easel is working out well. Rachael Hooper - the easel is a HBH1800 with an extended centre shaft. The easels fitted so beautifully in with the rustic vintage theme! Three people asked me on the night where I got them from, so I hope I could generate some business for you. Take care. Greetings Marina - The easels were DL size in Jarrah. Daniel Griffiths has purchased easels from me over a number of years . Here is his studio. Daniel is one of the top 10 photographers in Australia. This multi award winning photographer personally shoots every wedding. He is a born and trained photographer. Daniel also extends himself beyond weddings: baby and family portraits. From the high profile to the humble Australian, Daniel's passion stems from a desire to capture the moment before it passes. His attention to detail is esteemed by his colleagues and cherished by his clients.heck out his marvelous web site. and contact Daniel for top quality photography. The Victorian Minister for Water, Peter Walsh MP presented a FFHVM easel in Jarrah, to the Chairman of GMW Water, Barry Clugston following his last official Board meeting on Wednesday 7 September 2011. Barry has been Chairman of the region's water authority for the past 11 years(Grampians Water from September 2000 to June 2004 and GWM Water from July 2004 to 30 September 2011). Barry has also participated as a member of Vic Water Council and our local Wimmera Catchment Management Authority to 30 June 2009. He has experience in natural resource management across western Victoria particularly in bio diversity, salinity and landcare areas. Barry also has a passion for artwork, cycling and nature. Hi Jeff - sorry it has taken so long to send you a pic of your easel in my studio but finally got around to it. I have had an exhibition to paint for so that took a lot of my time. But done and dusted now. I am absolutely thrilled with both easels and love working on them - the only problem is I now have got them dirty. ( just joking) I tell all who ask about easels to buy one from you. Hope all is well and your not working too hard!! We are very happy with our easel and the RRG timber matches a number of RRG pieces in the room perfectly. Wedding Display at the Grand Pearl Seafood Restaurant, Canley Vale Sydney. Book a table with Ken Ouy - 02 97236888, you will not be disappointed. The easel is a Black Aluminum. I am halfway through the Chapel St Precinct, Art Town art exhibition, so I thought I would show the progress so far. I had such a great weekend in the sun doing what I love and watching the street-life of Windsor unfold. I have finally finished the Chapel st artwork after four sessions of outdoor painting. The people I met during the process were really fantastic and supportive, some even stopping to pose for the painting, thanks specially to Colin (front and centre) who was a true Windsor local! I set up my new easel on the weekend. Thanks for all the advice in the detailed instructions, I got the exact glue that you suggested and it has worked a treat. Thank you we received the easels and our Technicians delivered to client this morning and have taken these photos attached. Kind Regards, Suzie - Easels are ABHL1800 with top mount. 360 Facility Management -If you’ve got better things to do than building support and maintenance, 360 Facility Management can take care of everything for you professionally, cost effectively and seamlessly. The new easel arrived just before Christmas and was easily assembled. I am very pleased with the ease of operation of the counterweight apparatus. Here are some pics of the easel in use. I have a very small studio space and the easel fits perfectly. It's the best investment I have made in my art to date! Let me know if the pics come through OK. I hope they can be of use to you. Kay purchased a HCH1600 counterweighted H frame. Thanks again, the easels looked really great at our event over the weekend! The easels are Silver Aluminum Easels, Very popular for display. It has been a few weeks now since you delivered the new studio easel. As you remember it was the HBK 1800.with optional tray and palette holders. I started using the easel from day one and have been over the moon with it. It is rock solid, which helps you to work Very precise if need be. Adjusting is a breeze. My previous easel was an a frame, which I now use for displaying and drying painting. Changing to the new easel is going from a Volkswagen to a Bentley; pure class. Thanks Jeff, you are a star!! Thank you for the confirmation. The package arrived at 7:30am this morning and we, i.e. Nathalie and I are delighted with the easels. Their simplicity is elegance itself and the wood and wood working is beautiful. Mark Purchased 320mm small easels for his wedding menu's and will ultimately use them to display photographs. Thank you again for your beautiful book stand. I am so glad that I chose the Grey Iron Bark wood. It is very strong and looks fantastic. The Koran sits perfectly on it. Time frame and delivery was spot on and the price was even better. Whoever sees the stand is taken away with amazement. Book stands like these are very hard if not impossible to find. Such a beautiful Koran deserves a beautiful stand. Thank you again Jeff. This is a Freestanding Book Stand with a 820x500mm solid top made from Grey Iron Bark to hold a copy of the Koran. Many thanks Ali!! We have just had the easels put together and they look great!! The first art tutor that saw them also thinks they are awesome. Hopefully we will be able to get more from you in future. - Ku-ring-gai purchased HBH1800 - H frame easels, they later ordered more! Thank you for the prompt arrival of my fantastic table easel. I love it! Attached a few pictures of your easel in use - a couple of my current projects. Now that I have seen your work I would like to order another easel. My easel family will be complete... looking forward to your wonderful craftsmanship. Lorraine ordered a DTWCH - desktop horizontal to vertical easel. I immediately - and with great excitement - assembled it. I had no trouble at all putting it together. And took your advice and used good wood glue. I'll be happy to send you a photo of the easel in use for your website. > I'd like to order a few more of the original standard ones too. > 12 more of the 220mm ones and 2 more of the 320 mm ones. > Hope all is well in Victoria land. >Warren initially ordered 32 small double sided easels for books for his bookshop. Then placed a second order. prompt delivery. I'm just off to put it together now. This HBH1800 is the second easel Ronnie Harris has purchased from me. The first was 3 years ago. It looks fantastic, but I must say I was surprised at how pale the wood colour is. If I decide that I want to deepen the colour a little, is there a product that you would recommend? Anne Maree ordered a ABHL1800 in Vic. Ash, this wood is not so dark when freshly sanded, but does darken with age. I do offer easels in a choice of stains and natural woods. 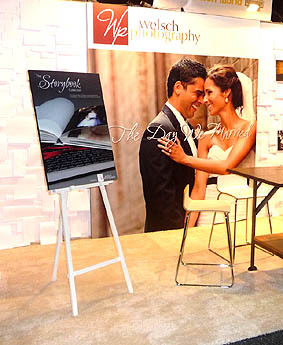 Top Shots Photography uses my Black Aluminum Easels for in store displays. The following tells you all about Top Shots. If you are looking for a photographer, consider them. Top Shots Photography specialize in Corporate/ Commercial, Photography as well as weddings and family portraiture. Their unique style of work has made us one of Victoria’s favorite photographers.heir studio is conveniently located in Endeavor Hills, a short distance from Melbourne and for customers living in the regional areas they also photograph in over 60 country locations throughout Victoria and Southern NSW. Please feel free to call their office on (03) 9700 6658 to find out if they are photographing in or near your town. Click on the photo to see more . thank you for the easel it's great. Arrived beautifully packaged at lunch time today. Very hard to find a suitable place to photograph it without other things around. Tried moving heaps of stuff but these photos are the best I could do. At least you can see how well the books will look on it. The permanent place for it will be in my little library the close up of the book was taken in there and it looks great against the dark plum wall. Unfortunately I don't have a whole wall without immoveable objects in there so had to move it to the paler walls of the hall. Thank you again, I'm thrilled with it. Patricia ordered a WIB1750 easel for a book, it is painted in an antique gold colour. Just wanted to thank you for supplying us with the beautiful easel in such quick time, we are very impressed with its design, as is my cat who thinks the tray was designed specifically for her to sleep on. I cant wait to start using it! Becc Orszag - Becc received a H Frame Standard, Student model and tray for her birthday. Great easel. Arrived safely. Packaging more difficult to remove than the easel was to put together. The easel is 750 mm high , built to his dimensions. I have to do is maintain the standard of the easel on the easel! Ray's easel is an oversized DTWCH full tilt desktop easel. Jeff, it is utterly wonderful. Worth every cent and well worth the wait. It is magnificent Thank you, Liz . 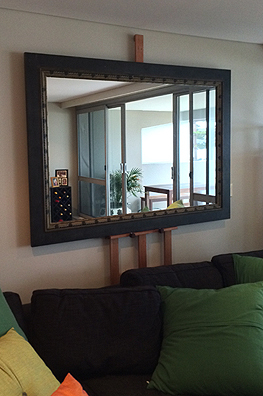 Liz from South Australia, ordered a HCH1600 - counterweighted H frame. - delivery at the time was 3 weeks. Thanks for sending this link. I was lucky enough to receive the easel itself before checking the emails, but now I can send the link to my friends and brag a little. he he. Thank you so much for this beautiful, special easel. Not only does it look good but it smells magnificent. I really like the idea of having the feel and smell of wood as I do my work. Wow. I won't actually be using it for real until next week, but for now I can just sit here and admire it. Wonderful. Thanks again, and all the best from me. exactly what I wanted; even down to the oil finished timbers. detriment of itself or the easel. In other words nothing broke or fell over! for both your service and your excellent product. Do keep up the good work. This is the easel and Mosaic (30 Kilogram weight) that Danny was talking about. His reference to bubble wrap: I sent the easel fully assembled as I wanted to make sure there would be no problems due to the weight it would carry. It was wrapped in multiple layers of bubble wrap, it would take him months to pop it. I liked the humor in his email!! 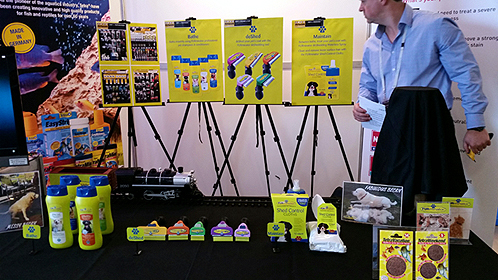 Please find attached a shot from the Exhibition Stand we've used you easel for. It looked great and very elegant. Finally, yesterday, I found the time to put your beautiful easel together with the help of a friend. It looks absolutely wonderful. So easy to move around, and today I got back into a pastel that had been sitting patiently since January to be finished. Can't wait to do my first mosaic on it!Anyway here are a few photos of one of my latest mosaic pieces, this is a table top inspired by Finnish wildflowers on me and my mum's trip to Finland last winter (Finland's summer). As yet I haven;t got legs for it but they should be finished by August. A local artist is making wrought iron legs to suit. So as you can see I will be able to do quite large works on your lovely easel. This table top measure 1.2 m in diameter. Hope you enjoy it, best wishes and thanks again on a job well done! manuel - Manuel is in New York USA he purchased a FFHVX easel. I have asked him to send a photo, which I trust he does. 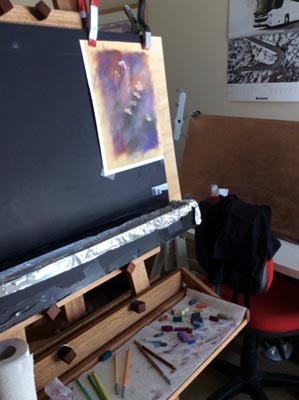 The summer art school was a success and for me your easel meant the following: ease of transport; easy to assemble; rock solid, held my board without a wobble or endeavoring to fall sideways; this time no distractions from the easel, the design is excellent. Thank you for a job well done. Rhonda - Rhonda bought a FFHVM with tilting tray and was looking for a stable versatile easel!! > expectation! thank you. A great job. > Also have the easel-care instructions too. > Will contact you perhaps mid 2008 toward another, larger easel. > Again, from one artist to another...well done! I received my easel today and must say THANKYOU. From the moment I contacted you, your service was outstanding. However it is the easel itself that has stolen your limelight! What a lovely thing it is. Something I will very much enjoy using. your package arrived safely here in Texas today. The easels are as good as the originals I have had for a time. Thank you very much for the fine workmanship and the expeditious handling of the order. The easel arrived safe and sound this morning . timber is superb - I'll have to stop as I'm running out of superlatives. again at some future date. 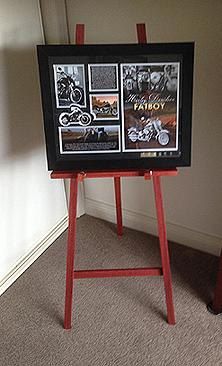 Patrick M. - Patrick ordered an ABKL1800 easel in Red Australian Hardwood. valves carrying it up the stairs. It sure is a solid sturdy easel. Anyhow... I would like to say that it is a truly beautiful easel. Thank you. will most certainly be letting them know about your work. Thanks again. Sincerely ... Kath Hulowatyi - Kath ordered a H frame in Red Hardwood which is very heavy!!!!!!!!! was that they were very solid, and beautifully crafted. The easel is very sturdy and will serve me well for many years to come. important in the selection of my easel. From: Hugh Walker - Melbourne. - Hugh ordered a Standard H Frame with wedge mounts and a longer centre shaft. Easel arrived today and assembled beautifully. wait to get started on it. craftsmanship is divine and I love the colour and tones of the Spotted Gum. They will be a perfect accompaniment to my two pieces. photographs with the art and easels together, and e-mail to you. I look forward to enjoying them both for many, many years to come. Simon - Simon purchased two fully folding Spotted Gum easels. in the park, the first of this monthly event. condition...have just about finished assembling it and it looks brilliant! Hi Jeff i received the easel today!! Wow! It is better than in the picture!! > shop. Thanks for a great job i will always recommend you to everyone. > Corey Hindmarsh - Cory ordered a AZH1900 with tray. > My easel has arrived, been constructed, and looks & feels really great. > Thanks for the easy purchase and fast delivery and easy assembly. > I look forward to many hours of painting at it. job with it. Thank you for all your help and best wishes for the future. Megan - Megan works for the Bridgewater Aged Care Facility and they purchased a wrought iron easel for a heavy glass plaque weighing 20 to 30 kilos. Michael & Helen-Maree - They ordered a freestanding book easel for a 6 kilo wedding album, I made it in Blackbutt and Turpentine woods. It this easel. The easel arrived on Friday promptly as promised. And no tap dancing with feet. Philip - Phillip bought a HCJ1600 which is a counterweighted Jarrah H frame. You may recall that I purchased your last "H" frame easel (sanded but unfinished) on Tuesday 20/9/05 just as you were about to move out of the Hampton Street residence. I bought it for my wife's birthday on the following day. I oiled it with Olive oil. She was thrilled to receive it and is so pleased with its sturdiness and beautiful craftsmanship. I was also most impressed as I am also an artist - I paint aircraft and I'm the President of the Australian Society of Aviation Artists. I am also the Editor of the Newsletter and I was very pleased to include an article on your easels in this newsletter. I will be posting a copy to you tomorrow and I hope that you enjoy it. I sat around admiring the magnificent craftsmanship of just the pieces of wood today, wonderfully shaped and sanded. My husband was out working and I had to wait for him to pick up the glue that you had recommended. When he arrived home with the tradesman glue he assembled your wonderful piece of art as I did not trust myself with stronger-than-a-glue-stick glue combined with screwdriver. Watching it being put together I am confident that when I buy another easel I wont be waiting for my husband, amidst his admiring comments on how well your easel was made I was content that I had made a great decision to order one from you. I loved the personal touch that had been lacking in the hundreds of easels in numerous art stores that I had searched, I loved that you signed it and that it still had sawdust in the screw holes. I am a fan forever, Jeff, you surely know your craft. The cube knobs are a great touch. I am amazed at how beautiful it looks, thank you for superseding my expectations. I will be sure to recommend you to every artist I know. i just wanted to say thank you a million for your great easel. most days to say hello. Comment from Jeff: I moved to Mt Eliza on 22 September 2005 it was an experience I do not want to repeat in a hurry. I just wanted you to know that your product exceeded my expectations. It is great! - Louis Deacon - USA - Louis bought a H frame with tray. Just to let you know the new easel is great and had a fair workout last weekend. Thank you again so much for making it quickly. November 6-8 pm and runs for 12days. something that is getting rarer by the day - personal service. admire the craftsmanship. Brilliant work. have absolutely no hesitation in recommending your product to anyone. Many thanks from yet another happy customer. which is now installed under a north facing opening roof...luxury. The easels are wonderful! How very cool and well made. It took me a second to figure out your instructions, but once I did, it was quite easy. I’am going to email my other art friends your web site. Thanks again for the beautiful easels. Maybe when I sell enough portraits to rich people, I’ll be able to afford your more expensive ones. In the meantime I’am quite pleased! Our Easels arrived today and we love them. They look fabulous. Thank you very much for a wonderful job. its here, and all I can say is WOW!! The wood is beautiful, the design is simple, elegant and functional, and it really is much more stable than even larger ones I looked at. Its everything you promised. Thank you so much I am delighted. such great service too. I can't believe how quickly it got here. Take care. Jacqueline -----------Jaqueline ordered a MP horizontal to vertical studio easel with tilt tray. and the advice given to me regarding maintenance". give them a good tug. They are easy to clean and look great.